Based on the claim of the company owned by the former employee of the Committee for State Security of USSR (KGB) – Yevgeny Kaspersky, the court has accepted the restrictions of freedom of speech similar to the ones existing in Russia and other autocratic regimes – that was a comment by the Member of the Parliament of the Republic of Latvia (Saeima) Krišjānis Feldmans (New Conservative Party), following the verdict in the case Kaspersky vs Feldmans by the City of Riga Zemgale District Court, the lowest level court in the three tier justice system of Latvia. “In fact, by this verdict the court has ruled that one cannot express one’s opinion on important social issues unless the person expressing such an opinion has conducted a large scale inspection of other opinions. As far as we know, this is the first time such restrictions on expressing an opinion have been applied in the Latvian judicial practice. Weird as it sounds, but the court has ignored the judicial practice of the European Court of Human Rights, which has not set such criteria for the expression of an opinion,” Feldmans stated, stressing that he is going to appeal the verdict in the Riga Regional Court. I do not understand the reason behind the court’s conclusion that stricter criteria have to be applied to the expression of a private opinion than to those of mass media. It is clear that such criteria strictly contradicts with the freedom of speech maxim that the European Court of Human Rights has established and strengthened for a long time. Therefore, the court is actually legitimizing censorship by stating that in order to express an unfavourable opinion to someone, one has to get acquainted with various sources of information, analyse them and actually coordinate it with the counterpart, Feldmans said. In this verdict the court has actually ruled that any person expressing an opinion that is not favourable to someone, but important to public, could be held liable. Recently, there have been several cases in Latvia when following a release of information of broader public significance, an individual has been held accountable and even criminal charges have been brought against him. “Censorship in Latvia is prohibited. The public is entitled to obtain information, including the one of high importance for the whole society. As far as I am concerned, I will not keep silent!” Feldmans stressed. 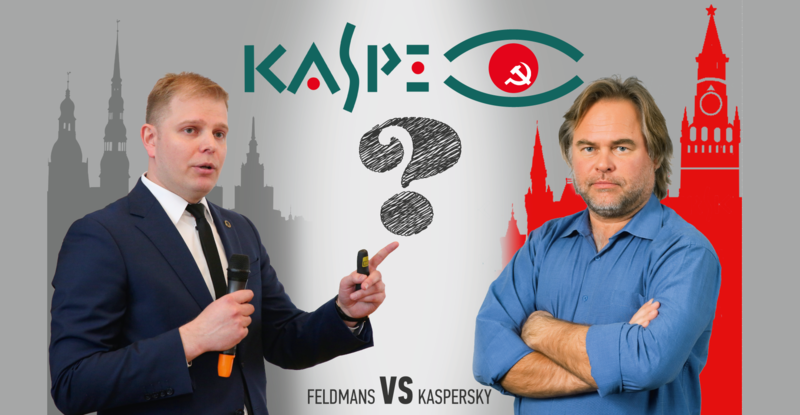 As it has been stated before, several institutions, organizations and experts have warned against using “Kaspersky Lab” products. It is prohibited to use the products of this company in the government institutions of the United States, which is a leading NATO member state. There was also a resolution on cyber-defence issues adopted by the European Parliament last year that recommended prohibiting products of Russian cyber-defence company “Kaspersky Lab” as being malicious; however, the Latvian court has not considered this fact.